Whether you are a convinced bachelor or a newly wedded-couple who loves dinner guests and throwing awesome parties, a sorority or fraternity remodeling your home or simply an enthusiast when it comes to serving drinks, wet bar designs for the home are something you should consider, not just for the looks and the impression, but also because of its practicality. As sinks are a common feature with wet-bars, serving drinks is that much simpler due to the possibility of cleaning glasses immediately or adding water to different drinks. Where is a Wet-Bar typically found? Even though a bar is thought to belong in pubs, cafés or restaurants, a wet-bar is an excellent add-on for homes which distinguish themselves through unique features. A wet-bar is generally constructed for entertainment reasons and located in basements or kitchens (although the living room is also an excellent place, especially if you entertain often). And because wet bar designs are not so difficult to create, many men turn them into their little home-improvement project and build them from scratch. Out of all the wet bar designs I have found, this is the one that appeals to me the most. This is probably because it is embraced by nature. There is nothing more scenic than savoring a drink with your loved one, while gazing at this wonderful view. The wet-bar itself is extremely simple and elegant. It in no way wishes to draw attention from the surroundings, and it is beautiful in its simplicity. The counter-tops are most probably made from marble, or engineered stone. The highlights of this wet bar are the oriental-inspired decorations. 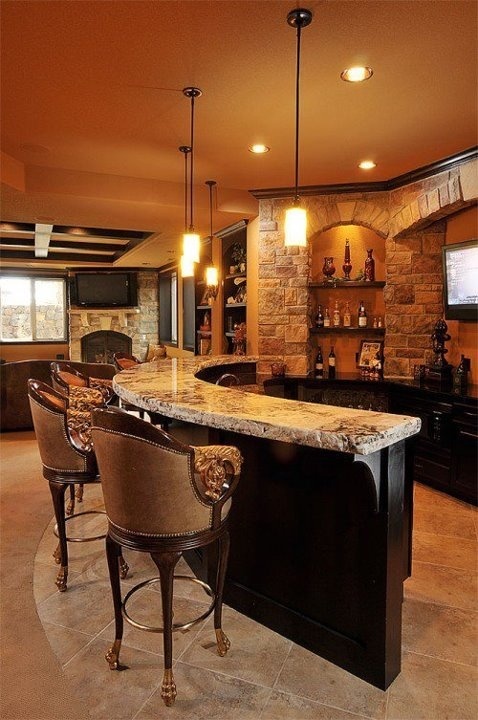 Are you looking for wet bar designs for basements? This edgy industrial metal wet bar design would definitely work in a more obscure setting. It is also extremely simple to set up. You can buy your bar cabinet from a flea store, or simply do it yourself with some metal that you have lying around and colorful accent. 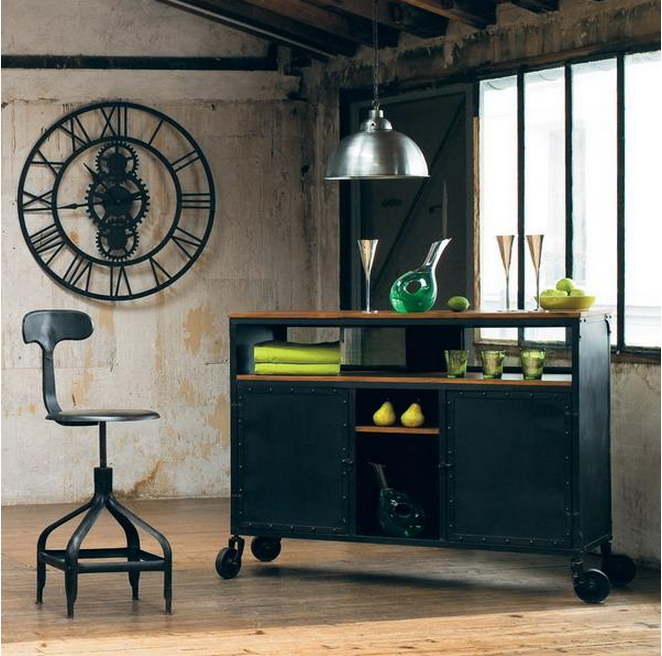 Everything comes together with the help of an industrial wall decoration and metal chair. There is no shortage of wet bar design ideas, as you will see from our list. Number 28 is an unusual, extremely colorful bar equipped with a large flat-screen, multiple drink coolers, a superb metallic cabinet and some truly fascinating chairs. 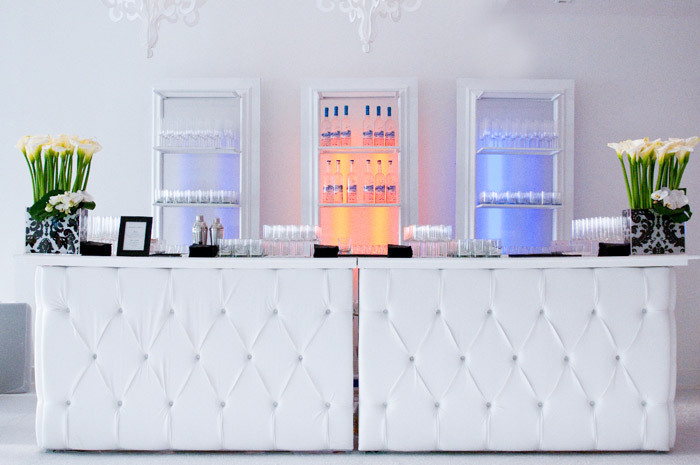 Although in the image presented we can see a rather large bar, the idea can also work with small wet bar designs. Wet bar design ideas come in all shapes and sizes. They can be customized and adjusted according to the needs and budget of every house. 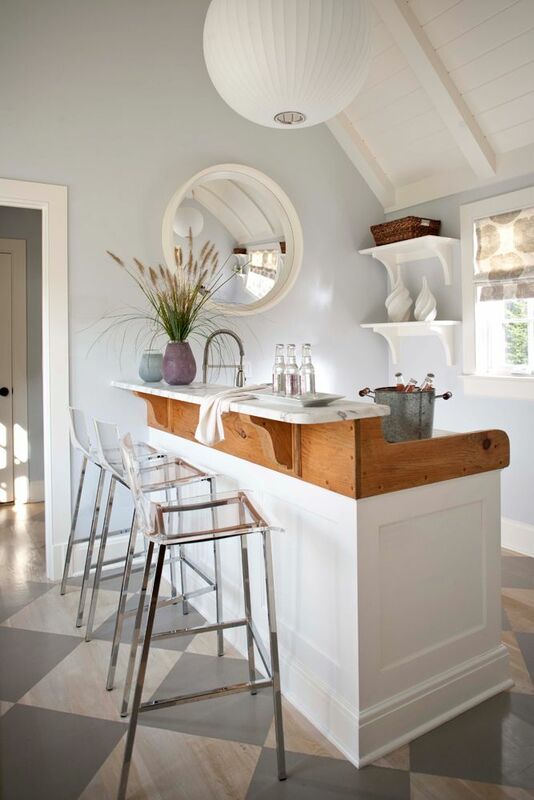 Take this stunning Barn Style wet bar design as an example. The owners reclaimed their walls and adorned them with refurbished wood, an antique wine holder + cabinet piece of furniture, some quite glass and soda bottles and a cute wooden chair. If barn-style bars aren’t really your thing you can go for something a bit more sophisticated, like the Refurbished antique bar. The top and bottom parts of the ensemble are completely opposite. 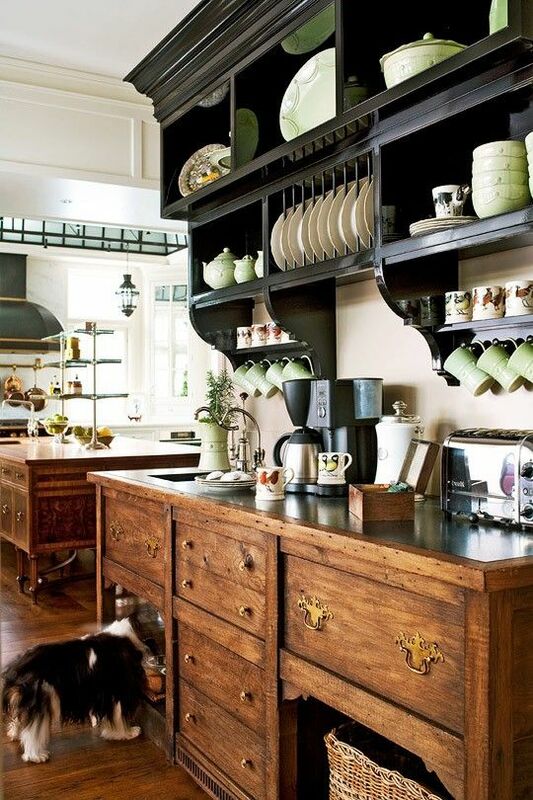 The counter-top and cabinet consist of salvaged massive wood furniture with golden metal details, and the upper section features dark-colored massive wood shelves. As unusual as the combination may sound it works extremely well with the kitchen. 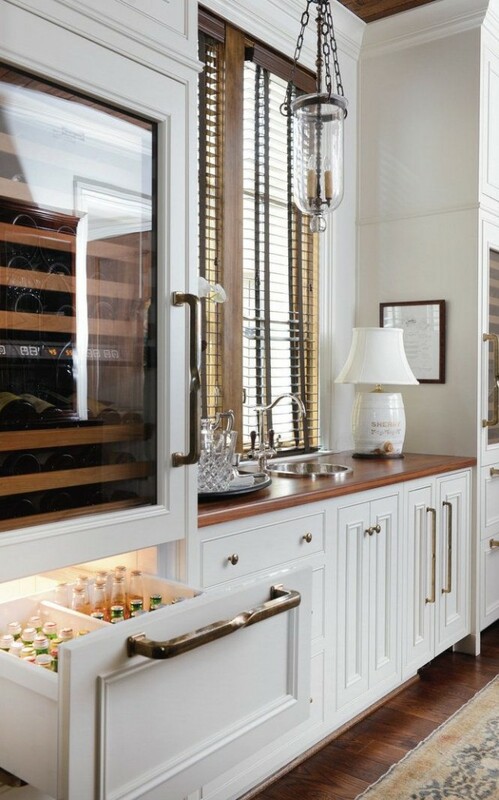 This is undoubtedly one of our favorite wet bar design ideas so far. It proves how easy it is to incorporate a wet-bar even in a small kitchen. All you need is a tall cabinet to hold the drinks and create a preparation space, a few stools and some fancy decorations. This way you can create a place of gathering and socializing in the kitchen. 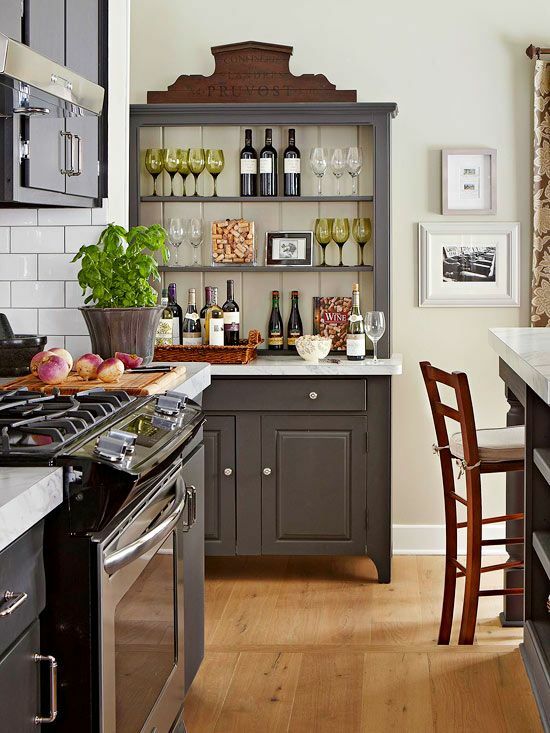 We must admit that these small wet bar designs add new life to otherwise boring kitchens. Do you feel that all the home wet bar designs that you have come across so far are overwhelming? Then why not go for a simple, elegant and awe-inspiring idea? 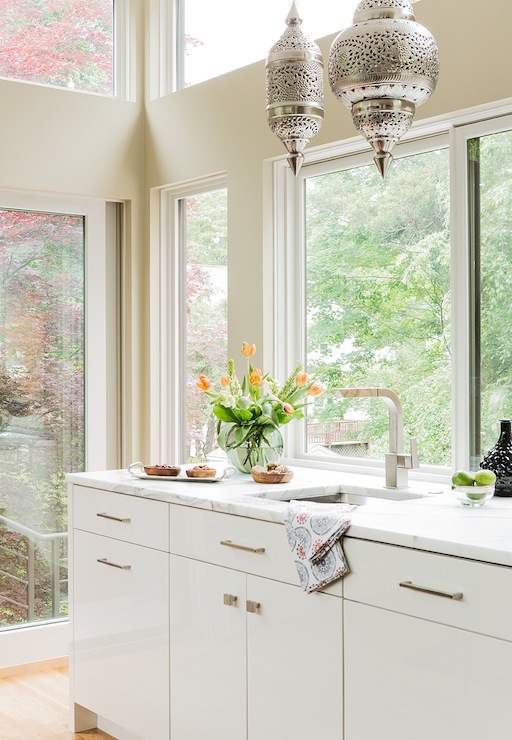 This Elegant white wood bar has everything it needs: a place to hold all the beer, a cooler, a small sink and a beautiful window view. We can assume that it can be found in the living room (what an excellent idea!). 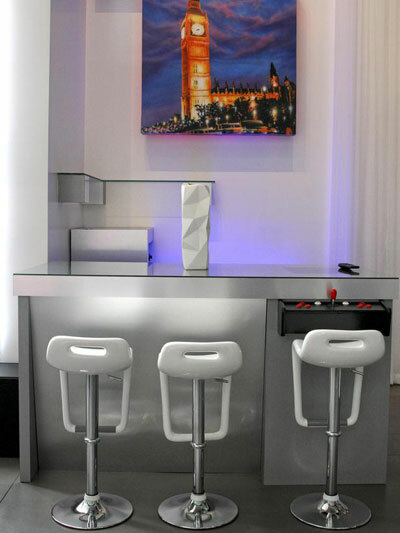 If you have living room space and have no idea what to do with it, why not incorporate a wet bar design into it? Your guests will love it. Since we have presented a minimalist wet bar earlier, we decided to stick to the pattern. This Pastel colored wet bar is similar to the previous example, but slightly different due to the floor tiling, choice of bar-stools and position. As you can see it can be found in an attic, and it does not take up a lot of space. 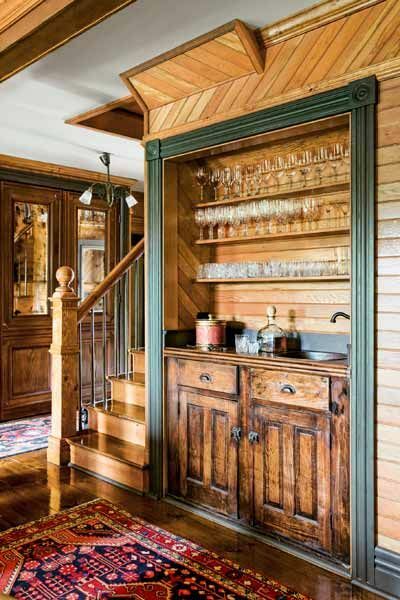 So if you have some free room in your attic you could definitely consider one of these small wet bar designs. As we were searching for unique wet bar designs we came across this absolutely unique idea. While you may not be able to recreate it entirely, it is still a great starting point. 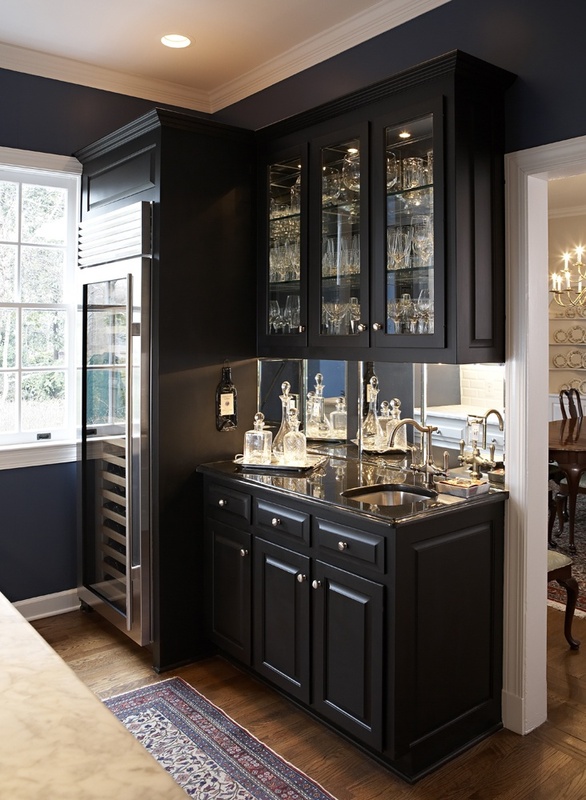 What makes this Navy Inspired wet bar so beautiful are the details. 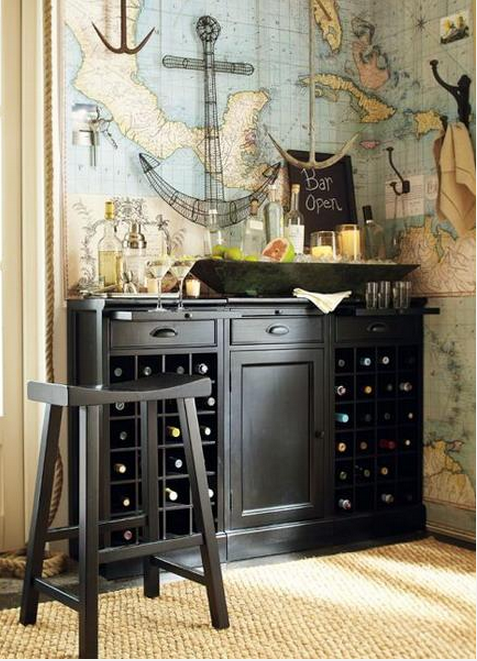 The Antique map wallpaper, the anchor wall decoration and the absolutely stunning bar cabinet look perfectly together. And do you see how little space it takes up? When creating small wet bar designs you should keep in mind that it is the little details that make everything look great. Let’s face it. Wood is the most interesting material that can be used for interior decorations. Due to its unexpected fibers and textures, it will warm up any room, and add an unique feel to it. A built-in wet bar is the ideal choice for a smaller home, because it will make entertaining easier, while not taking up too much space. For example, you can coat a closet entry into an wet-bar, and welcome your guests with drinks every time. Not everybody has money to invest into a wet bar, but this doesn’t mean that they can’t create one from scratch. Men will particularly enjoy this challenge, I assure you. 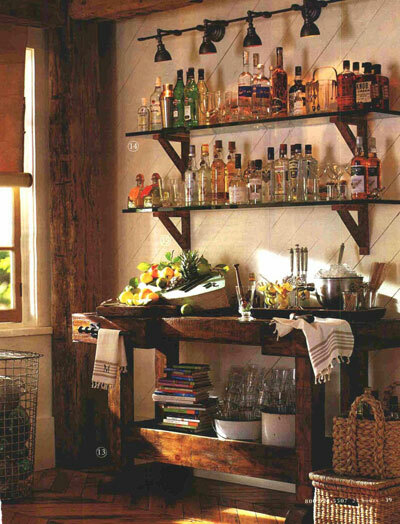 Just take a look at the wet bar bellow: they used some wooden boards that they had lying around, and crafted the table themselves. All you need is a little willpower, some nails and wood, and you will create the wet-bar of your dreams. 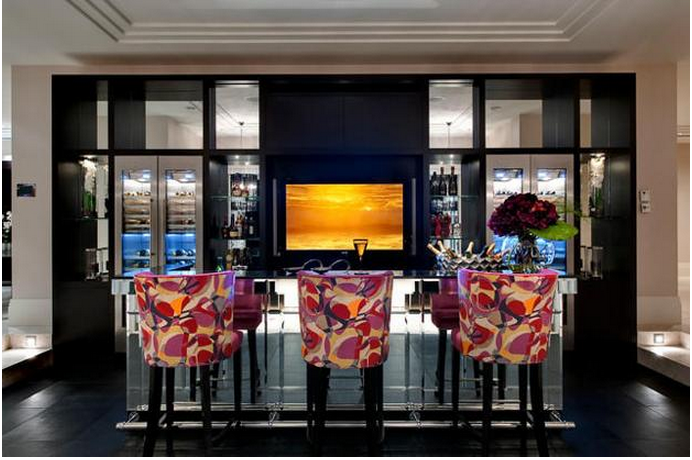 This superb wet bar idea makes use of the most luxurious materials, exquisite furniture pieces, and excellent lighting. It is the ideal choice for pretentious homes, or lavish houses. The marble floor, and solid stone counter-tops add to beauty of the ensemble. As a matter of fact this wet-bar is so large that it kind of looks like a kitchen and is one of the most luxurious wet-bar designs for the home we have featured in this post. 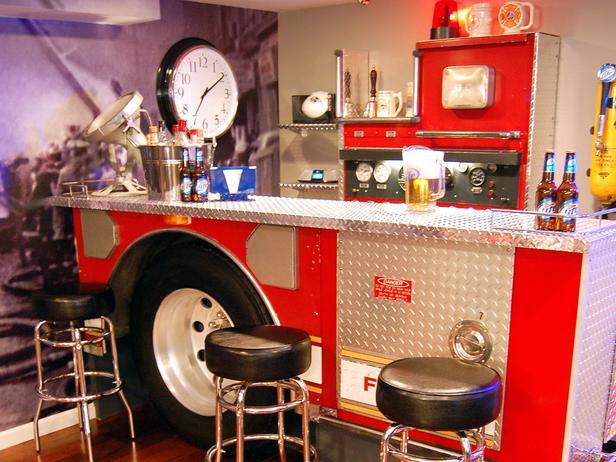 Just imagine it: you walk up the stairs and ring the doorbell, your hosts greet you, take your coats and invite you in the living room, where, behold, a pimped-up firefighter car with the red paint and the metal coating, the tires and warning lights has been reconditioned into a stunning wet-bar. To be honest, it’s not even that difficult. You add a sink here, attach some pipes there, take the monstrosity and pin it in place and keep the tires for added décor. Voila! Your mini Fire Brigade with alcohol on top. Small wet bar designs for small spaces have the potential of looking psychedelic. 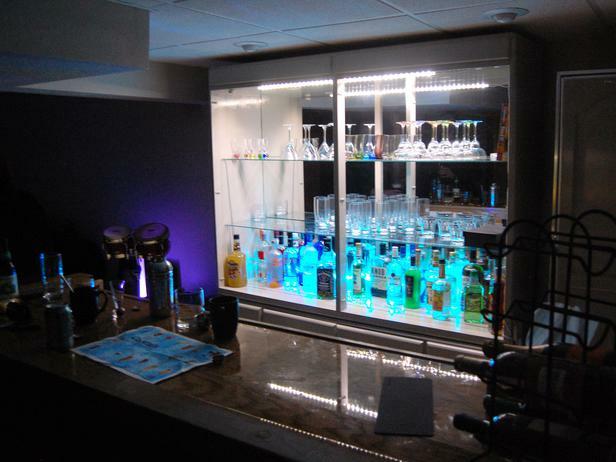 For those of you who want something extra to show off, or if you simply have a bachelor pad that is missing something extra, a Wet-bar equipped with fancy neon lights. This is the perfect place to live out you last day as a bachelor, before you run off into the sunset with your bride-to-be. Adding mirrors or reflective surfaces can add to the general appeal of the bar, and having a glass shelf or two for glasses can add a bit more edge to an already unique concept. 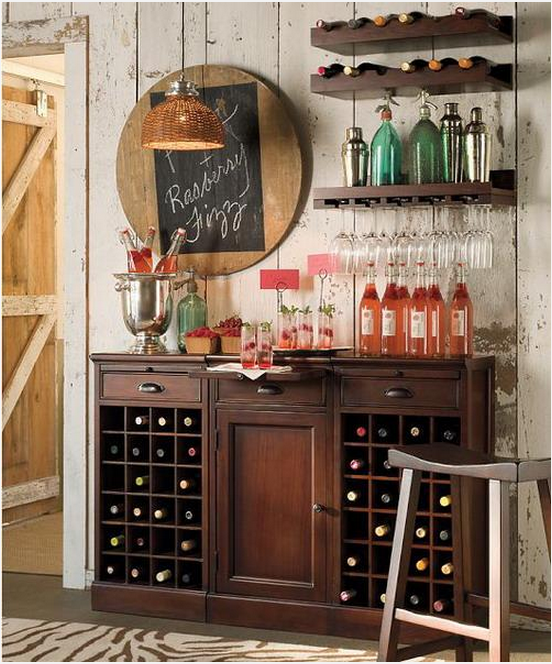 There is a special feeling that a simple, red brick bar paired with steel chairs and bottle racks brings to a room. It doesn’t just scream bachelor pad (although it would go perfectly in a game room down in a basement), since it can also be paired with a couple of cozy red lights and some pillows to give it a homey vibe. 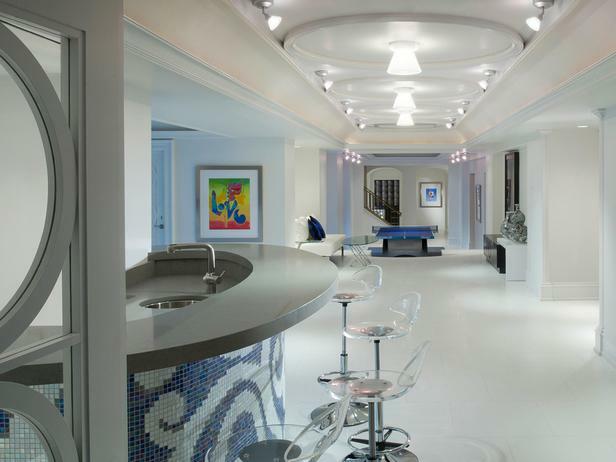 Out of all the examples in our lists, this is probably one of the best wet bar designs for basement. Who knows, the way its looks makes me want to use it for Halloween, along with some scary looking cookies. When in search of the exact balance between elegance, opulence and taste, a solid wood bar is certainly worth considering. There are several designs that will certainly please even the pickiest buyers. 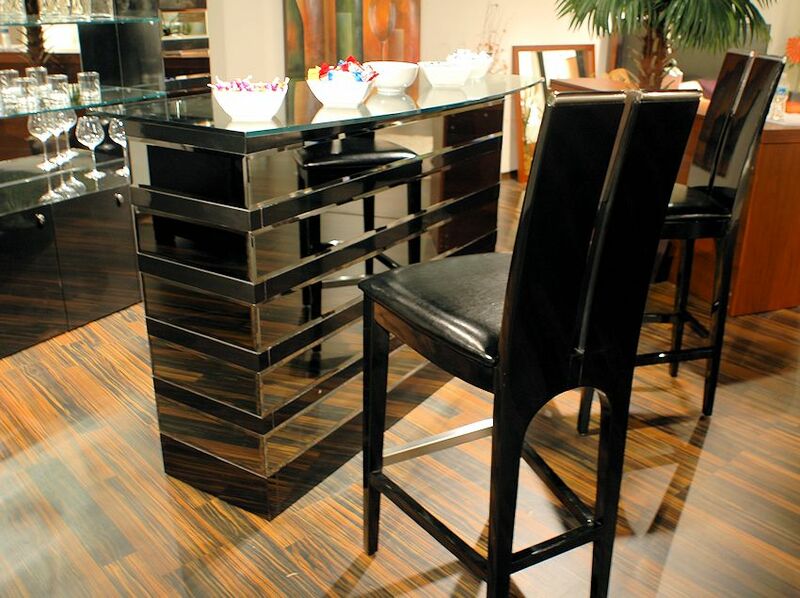 Massive cherry wood has such a warm, deep and dark color that works perfectly when paired with black leather chairs and simple walls with minimal decorations. Because of the finesse and elegance of the woodwork, there is no need to add details or decorations to the room. You will surely feel extremely proud with such an acquisition. Although there are few among us who still practice hunting, that shouldn’t keep us from turning a small corner of our home into a hunter-themed bar. Some solid wood or preferably logs you chopped up yourself and coated with varnish, a simple wooden board, some home-made bar chairs that fit with the décor, ceramic mugs, oil lamps and a couple of blankets and you’re all set. The alternative to solid woodwork is opting for minimalist, modern furniture with a small counter, a few abstract chairs and as few details and decorations as possible. All of these elements will help you with your wet bar designs for small spaces. Mirrors or glass work perfectly with such designs because they lighten the area and give the entire ensemble a precious feel. They also amplify the space, and make it seem larger. Just because we live in 2013 doesn’t mean that it’s time to let go of the old and focus on the new. There are wonderful influences that we can incorporate in home wet bar designs that will catch the eye of every house guest that steps over your threshold. Some intricate woodwork out of chestnut wood combined with beautiful, spacious, white leather chairs and discrete lighting will create an exquisite space of retreat in the seclusion of your own home. When space is a problem you will have to do with some small wet bar designs. This doesn’t mean that they will look less cool. 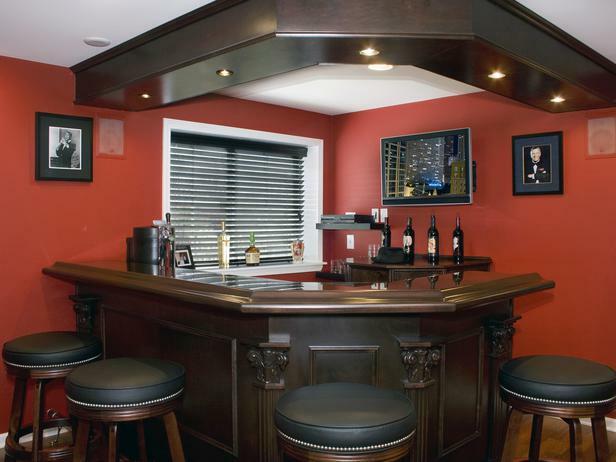 Number 10 on our list is a perfect example of small wet bar designs for basement. Who said you can’t use any type of material to build a neat and fancy bar to impress the ladies? 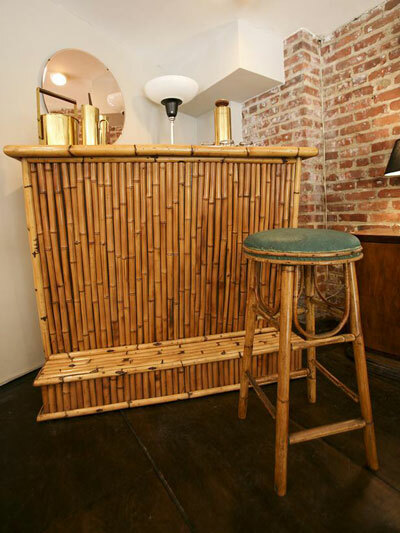 Some varnished bamboo placed strategically around your bar to create the impression that you are on a Jamaican island and some simple bamboo bar chairs are all you need to greet visitors with a little corner of bliss. Some tropical plants here and there, Mojito’s and Pineapples and you’re all set. Who said he doesn’t know the definition of happiness, has never shared a drink with a beautiful young lady. 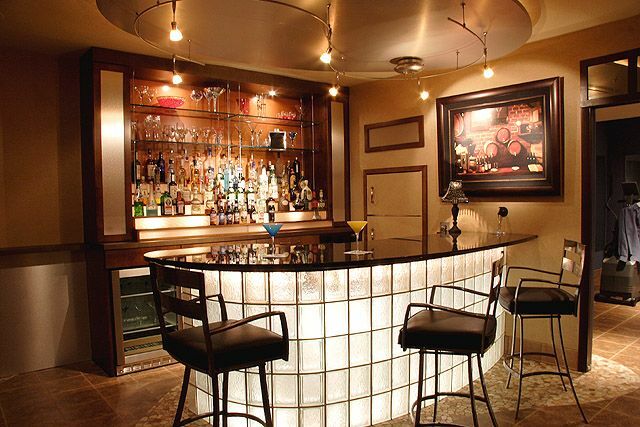 There are countless ways to design a glass bar, and for the courageous of you, there clearly is no better choice. Whether you have simple see-through glass that allows everyone to witness your cocktail mixing talents, or you decide to mix and match glass tiles that are differently illuminated, to create a fresh and free feeling, glass, home wet bar designs make wonderful additions and should find themselves on your home improvement list. Two seemingly impossible to combine elements come together in perfect harmony when done right. 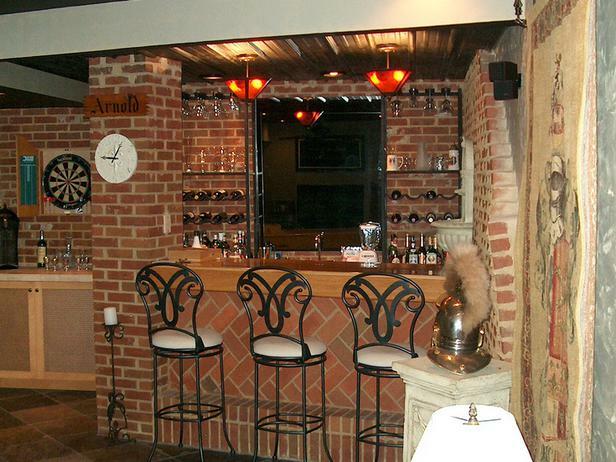 A brick bar with a beautiful glass tiles and counter top and well-chosen lighting can turn a seemingly boring room into something quite remarkable. As a matter of fact, the choice of lighting was so inspired that you may not have noticed that this is actually a basement wet bar design idea. Pair this with some beautiful bar chairs (brass would go perfectly) and you’ve got yourself a unique space to entertain. Many people I know own basements but have no idea what to do with them. They simply through their junk down there. 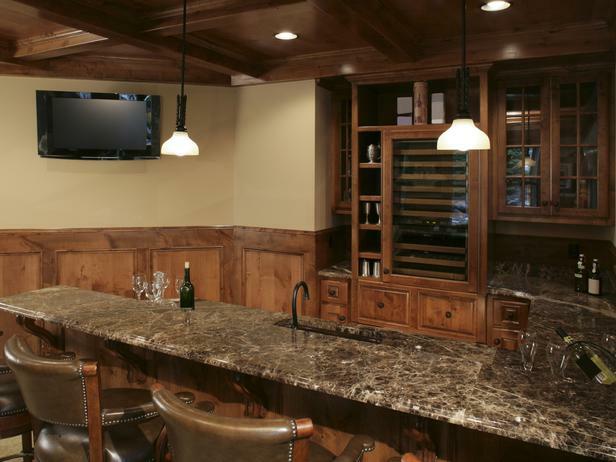 Have you ever considered a basement wet bar design for your home? Just take a look at this marble wet bar beauty. Marble may not be an all-time favorite material, perhaps because of its heat repelling properties, but it makes an exquisite counter-top for those in search of elegant home wet bar designs. Easy to maintain, elegant and precious, it can be paired with almost any other material and is surely worth considering when ideas are scarce. Nevertheless, it is quite costly and you should prepare yourself for the home improvement costs. Fascination with the times when writing letters in pen or even with feathers covered in ink will never cease, so why should we not revive a part of its decorative elegance and incorporate it into a well-designed wet-bar? Some wooden cabinets with small windows, candle holder and large candles, beautiful simple wood counter tops and only the finest chairs – that is surely a recipe for success. To add to the 1700s feeling of the ensemble, you can also accessorize it with one of these exquisite vintage phones. Alternative materials are always welcome in the design of new and unique elements in our homes, and mosaic is certainly not considered a usual material. It works beautifully however, when colors are cleverly chosen, to give the bar you are constructing a special something that everyone will notice. Be sure to pick chairs that don’t take away from the beauty of the mosaic, and if they are see through, that much better- it will make it possible for guests to marvel at your mosaic pattern uninterrupted. Another thing to consider is the fact that simple, mosaic bars with strong lighting work well as basement wet bar design. The mosaic will reflect the light in the room, and the white furniture will also propagate the light through the room. Let’s face it, there are 2 things that guys can’t live without. Football and beer. And food. Three things. Oh, and occasionally women. But you will become their queen if you accommodate their needs elegantly, and what better way than a wet-bar/game theater that is exquisitely designed. 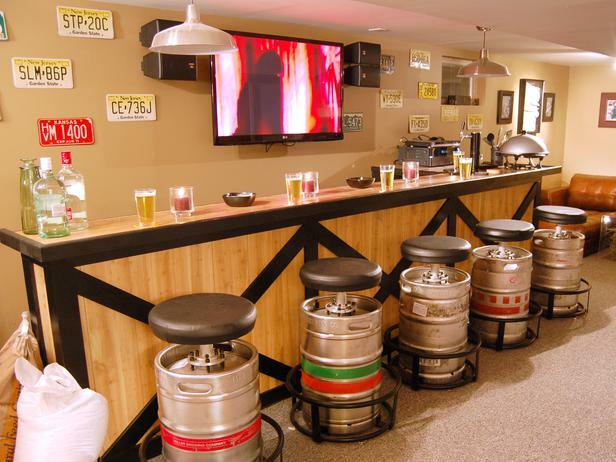 They don’t necessarily need light to watch their favorite football teams on the field, so why not go for some small wet bar designs for basement? 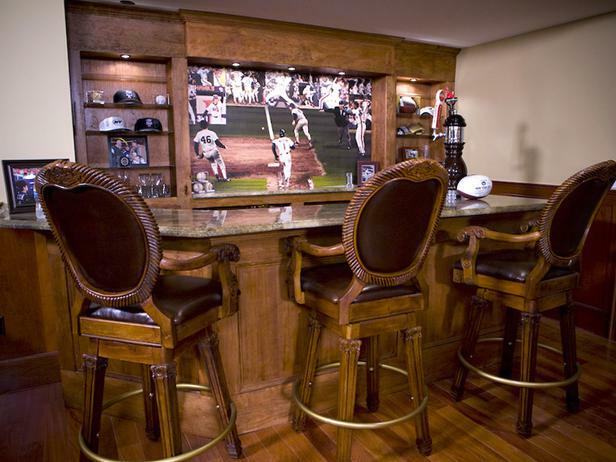 With comfortable leather bar chairs, a beer-keg, some signed balls or caps for décor and a giant plasma-TV in the middle so that they can watch their favorite teams playing while mixing drinks. What could be sweeter? 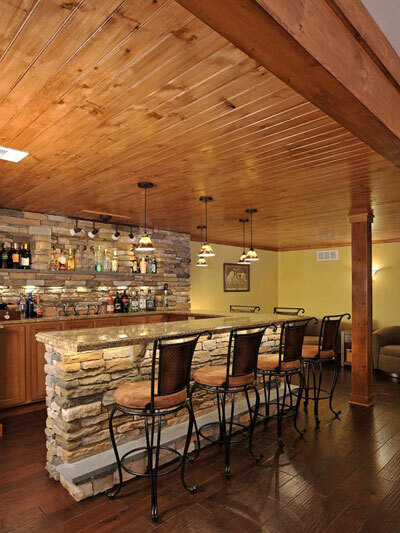 Are you searching for small wet bar designs for basement? Look no further. 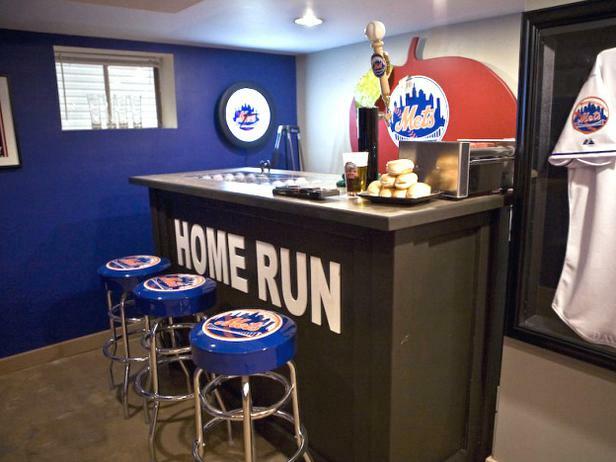 The Baseball Themed wet bar designs are limited only by imagination. While not as fancy as the previous design, this wet bar design is simple, does the work and is clearly made by guys, for guys. Nothing too fancy, no new-spangled material. A simple bar with an ordinary counter top, some T-shirts and other team memorabilia, personalized chairs and a fresh stash of hot-dogs. There is nothing more an average guy would wish for that has not yet been provided. Also, guys don’t need a lot of space to feel comfortable, so wet bar designs for small spaces will work perfectly for your hubby and his friends. And then there is the do it yourself bar that actually looks like the do it yourself project because it is meant to. This is clearly not for the faint-hearted, but an industrial wet bar design is clearly a unique construction if not in your city, at least in your district. You can recondition pretty much anything and use them as chairs, from car steering wheels to kegs, barrels, pipes or whatever else strikes your fancy. The great thing about it is that it fits in the wet bar designs for basements category. With this crazy design you can bring back to life a room from your basement that has laid vacant until now. The bar itself can be made from either wood or the above mentioned materials bended or modified to fit the desired design. This is surely not an easy task to perform, because choosing a counter top will prove a very difficult decision (since conventional materials will not really fit to your desired look). For this reason, the faint-hearted should not embark on such a project, because if their conviction is not 100%, the project will soon be abandoned. This is another tricky design to achieve, in part because it looks so simple. White and classy is not so easy to nail, and elegance through simplicity can be extremely beautiful but it can also go terribly wrong. Make sure to consult an interior design specialist when attempting such constructions because they will be the highlight of your home, so they need to look perfect. All in all, wet bar designs for the home stand to greatly improve the look and functionality of any living space. What do you say: if budgeting were not an issue, which one would you spring for? Or are these designs simply too much for you to consider, for various reasons? If so, do not forget to let us know what those reasons are in the comment section. You can find more home bar ideas here.